How do we celebrate our birthday? Party with family and close friends at a rented function room on weekend, simple restaurant dinner with family? Surely such gathering makes us feel good at the turn of another year of our lives. But how does it feel to treat random people around you and generate smile on their faces? We’d like to say it’s priceless. 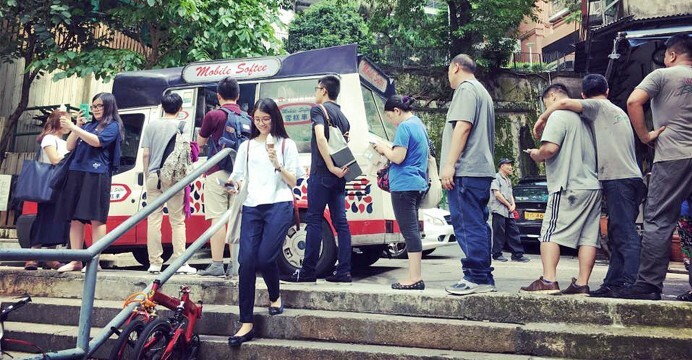 An American living in Hong Kong for the past 26 years just celebrated her birthday by buying out a day’s supply of ice cream from a van so everyone could get their share of her celebration with free ice cream. On a hot summer day, it’s indeed a welcome treat. According to Ming Pao Daily, the woman, Jeanne Thornhill, has been offering ice cream treats on Wan Chai’s Stone Nullah Lane since 2013. In 2014, Thornhill spent HK$5,800 for over 500 ice cream cones handed out to people within two-and-a-half hours. One of the recipients, a veterinarian, took to Facebook to thank the woman. “I asked the lady where her dogs come from. She said she adopted one from the Society for the Prevention of Cruelty to Animals and met the other one in Shek O Beach,” the vet wrote. Taking global headlines in a perspective, the veterinarian concluded that love still remains. The vet ended her Facebook post with a thoughtful reflection. “When terrorist attacks happened in London and Manchester, it seemed to me that the world lacked love, but the woman’s actions have melted my heart,” she wrote. Indeed, in Hong Kong, where we read news about people committing suicide due to life’s pressures, witness some of them lack goodwill gesture by opening doors before others or keeping elevator doors open to allow others in, as they race against the city’s fast-paced life, Ms Thornhill — and other people who try to bring smiles to strangers through such efforts, inject happiness in a city that desperately needs one.